After winning back the US House of Representatives in 2018, the Democratic Party intends to make a far-reaching anti-corruption bill aimed at drastically reducing the influence of money in US politics their first legislative priority (Fandos and Edmondson 2018). The proposed bill includes significant reforms to election campaign financing and ties in with considerable public concerns about campaign spending and the influence of big donors over political decisions. A recent PEW Research poll indeed indicates that more than two-thirds of Americans – Democrats as well as Republicans – support imposing limits on campaign spending, and fear that the political influence of big donors exceeds that of other people (Jones, 2018). These concerns are not uniquely American. In fact, the potential conflicts of interest arising from substantial financial donations to political parties (or individual politicians) have induced bans on direct corporate political donations in several countries across the globe (IDEA 2015), most recently in Lithuania (in 2012) and Brazil (in 2016). Alongside a lively academic literature investigating firms’ donation decisions (Ansolabehere et al. 2003), recent empirical evidence highlights the existence of preferential treatment towards donor firms in public procurement allocation processes in Brazil and Lithuania (Boas et al. 2014, Baltrunaite 2019), as well as firms’ use of donations to gain access to policy-relevant committees in US state legislatures (Fouirnaies and Hall 2018). These findings strongly suggest that widespread public concerns about the role and influence of money in politics may not be without foundation. Important questions remain, however, regarding the mechanisms behind such political favouritism and the strategies employed by public authorities to benefit donor firms. In this column, we address these questions based on insights from recent research using detailed data on political donations and public procurement allocations in the Czech Republic, where corporate donations to parties are entirely legal, subject to full transparency by the parties themselves (Titl and Geys 2019). Although such donations are not very large compared to GDP and most firms do not donate at all, direct corporate donations constitute an important source of income for the main Czech parties. For instance, they constitute about 10% of the revenues of left-wing parties, and 23–33% for right-wing parties (Skuhrovec et al. 2015). Moreover, until recently, the regional administrators formally in charge of procurement allocations were most often political appointees rather than career civil servants. Such politicisation of the civil service leaves significant potential for corporate donations to carry weight in the procurement allocation process. Analysing data covering procurement contracts awarded by the Czech regions in the period 2006–2014, we first of all find that firms increasing their donations to a political party by 10% on average see the value of their public procurement contracts increase by 0.5–0.6% in the following year (Titl and Geys 2019). Evaluated at the mean donation and procurement contract, one additional dollar of donations increases the value of procurement contracts obtained by the donating firm in the following year by roughly $100 on average. While this seems like a massive return on investment, it should be remembered that these are revenues and not profits. Even so, donations appear to be a good investment, given that the profitability rate of Czech firms is about 9.5% (Bank for the Accounts of Companies Harmonized 2014). A possible concern with this simple correlation is that it may reflect the most competitive firms winning contracts while being ideologically close to the party in power. Using sudden shifts in parties’ political power following the 2008 landslide regional elections in a difference-in-difference specification, Figure 1 demonstrates that we can rule out this possibility. Figure 1 plots the ratio of the value of (logged) public procurement contracts supplied by donors to the Civil Democratic Party (ODS) or Czech Social Democratic Party (ČSSD) in a given year over the (logged) sum of corporate donations to ODS and ČSSD. Each line thus represents a measure of how beneficial it was to donate to a given party in terms of the value of awarded public procurement contracts. Higher values reflect a higher procurement ‘return’ on a political donation. Clearly, donations to the party gaining power in the 2008 elections (ČSSD; red line in Figure 1) are associated with an increase in the value of the firm’s procurement contracts, whereas the reverse occurs for donations to the party losing power in the 2008 election (ODS; blue line in Figure 1). Notes: Both lines reflect the ratio of (logged) public procurement contracts values supplied by contractors donating to ODS or ČSSD in a given year over the (logged) sum of these firms’ donations to ODS and ČSSD. Source: Titl and Geys (2019). What are the mechanisms behind this apparent political favouritism to donor firms? In practice, different legal rules often exist for small and large procurement projects, where the former are generally subject to less supervision and regulation (or may even be allocated using a closed negotiated procedure rather than an open tender process). Exploiting legal thresholds to differentiate small and large procurement projects, we show that donating firms start to receive more contracts below this threshold. Moreover, contracting authorities appear to manipulate the cost estimates of procurement projects (which we refer to as ‘anticipated prices’; Titl and Geys, 2019). Since these cost estimates determine whether a contract is above or below the legal threshold inducing increased supervision and regulation, such manipulation would allow contracting authorities to benefit from the less-regulated procedures available for smaller contracts (for a similar approach at different a threshold, see also Palguta and Pertold 2017). 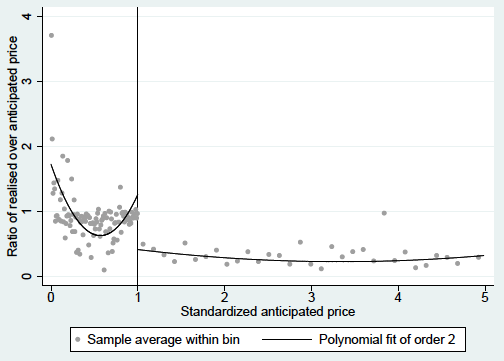 This manipulation is visible in Figure 2, which plots anticipated contract prices against the ratio of realised-to-anticipated prices (where the realised price is the winning bid actually paid to the contractor). Each dot in the figure represents a bin of procurement contracts with a given anticipated price awarded by the Czech regions. We can see that the ratio of realised-to-anticipated prices increases just below the threshold separating small (less regulated) and large (more regulated) contracts, which indicates a growing difference between contracting authorities’ cost estimate and the realised price. At the threshold, there also is a substantial and significant drop in the ratio. While some caution is due since both prices in the ratio might be endogenous, these findings together strongly suggest some degree of manipulation of the cost estimates just below the threshold. Notes: Each dot represents one bin of procurement contracts with a given anticipated price awarded by the Czech regions. On the horizontal axis is the anticipated cost of the contract (standardised to equal 1 for contracts where this anticipated cost equals the threshold between strongly and weakly regulated contract allocation procedures). On the vertical axis is the ratio between the anticipated cost and the realised price bid by the winning firm. Source: Title and Geys (2019). Finally, we also uncover evidence that, compared to firms that do not donate to political parties, corporate donors tend to face fewer competitors in more regulated and open procurement procedures. This indicates an alternative mechanism through which contracting authorities use their control over the procurement process to favour donating firms (e.g. by imposing stringent qualification criteria beneficial to a limited number of particular firms). It also suggests that different strategies might come into play depending on the size of the procurement contracts. When procurement projects are too large to credibly provide a cost estimate below the legal threshold for increased supervision, contracting authorities instead appear to limit the level of competition faced by political donors. Taken together, these results are indicative of different forms of strategic behaviour engaged in by contracting authorities to favour corporate donors. The nature of the strategies employed appears to change depending on the size of the procurement contract. Hence, one could credibly argue that there might exist a need to “isolate and quarantine the ability of big money to infect the decisions made every day by every branch of our government”, as recently stated by Democratic Senator Elizabeth Warren (Nilsen 2018). In the case of public procurement processes, this can be done by either extending oversight and stricter regulations to smaller contracts, or by imposing tighter restrictions on corporate donations. Given limited government resources, the former solution requires setting a threshold where the marginal cost of oversight equals the marginal benefit from reduced misallocation of procurement contracts due to political favouritism. It is not clear that the current thresholds imposed in many Western countries – including the US – meet this requirement. The latter solution – i.e. a ban or limit on corporate campaign donations – might seem a natural remedy, but also has a potentially important downside. A ban might simply ‘switch off the lights’ and make it harder to observe who tries to influence political decisions (even assuming that previously legal donations do not translate into increased illegal support after a ban is implemented). Hence, it may be worthwhile to combine tighter rules on corporate donations with substantially increased transparency about such donations. Ansolabehere S, JM de Figueiredo and JM Snyder Jr. (2003), “Why is there so little money in US politics?”, Journal of Economic Perspectives 17: 105-130. Baltrunaite, A (forthcoming), “Political contributions and public procurement: Evidence from Lithuania”, Journal of the European Economic Association. Bank for the Accounts of Companies Harmonized (2014), Financial structure and profitability of European companies: Outlook. Taylor, B, D Hidalgo and N Richardson (2014), “The spoils of victory: Campaign donations and government contracts in Brazil”, Journal of Politics 76: 415-429. Nicholas, F, and C Edmondson (2018), “With no votes scheduled, a government shutdown will greet the Democratic House”, New York Times, 27 December. Fouirnaies, A, and AB Hall (2018), “How do interest groups seek access to committees?”, American Journal of Political Science 62: 132-147. IDEA (2015), Political finance database. Jones, B (2018), “Most Americans want to limit campaign spending, say big donors have greater political influence”, Fact Tank, 8 May. Kwon, I (2014), “Motivation, discretion, and corruption”, Journal of Public Administration Research and Theory 24(3): 765-794. Nilsen, E (2018), “Sen. Elizabeth Warren just unveiled a dramatic plan to eradicate Washington corruption”, VOX, 21 August. OECD (2017), Government at a glance, OECD Publishing. Palguta, J, and F, Pertold (2017), “Manipulation of procurement contracts: Evidence from the introduction of discretionary thresholds”, American Economic Journal: Economic Policy 9(2): 293-315. Skuhrovec, J, V Titl and M Palanský (2015), "Analysis of Czech political party donations", mimeo, Centre for Applied Economics, Charles University, Prague. Titl, V, and B Geys (2019), “Political donations and the allocation of public procurement contracts”, European Economic Review 111: 443-458.